Work through a series of jealousy management activities and games with this handy set of cards which covers everything from recognising jealousy to dealing with its consequences. 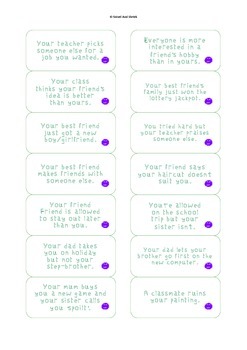 Presented as a set of cards which you can print, laminate and cut out, each colour-coded section offers a different angle from which to work on anger management. For example, DESCRIBING JEALOUSY: Explain the term 'synonym'. 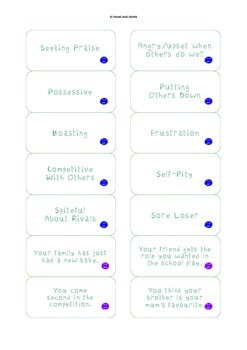 Challenge the players to arrange the 'synonym' cards in order from least jealous to most jealous. Discuss the reasons for this. If there is more than one player, compare. Similarly, another activity example is for RECOGNISING JEALOUSY: Ask the player to draw an outline of a human body on paper and use the cards as prompts to illustrate or label the signs of jealousy that appear in the body. In what order do they appear? Discuss which signs help them to recognise jealousy in themselves and in others. These, and many other activities are included in this pack. Just print and cut out (laminate, if you wish) and you have a pack of cards that can be easily stored and produced at a moment's notice. Simple activities that can be used as starters or else expanded into full lessons. Supports development of social skills. Great for 1-to-1 work, groups or whole classes.